A Multitude of Dining Options! 4D3N from SGD 1618 / person ONLY! 5D4N from SGD 2068 / person ONLY! 4D3N from SGD 1858 / person ONLY! 5D4N from SGD 2388 / person ONLY! 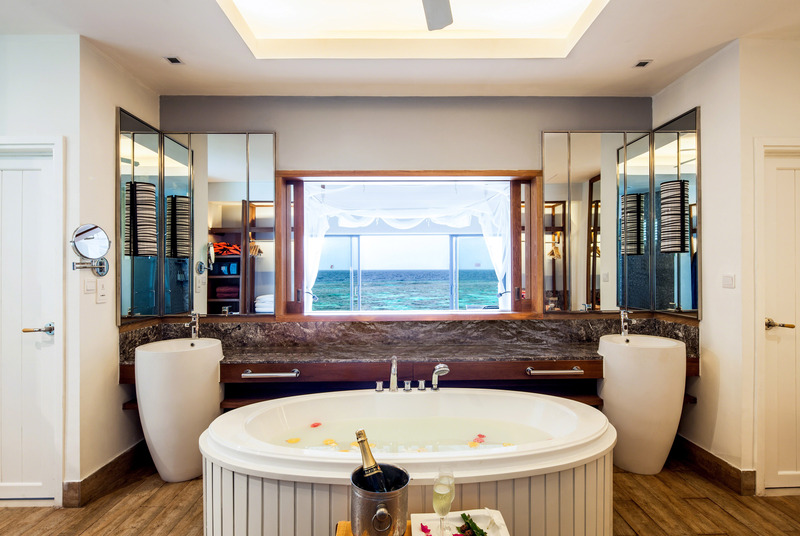 Complimentary refreshing towels and a glass of champagne will be provided upon arrival at the resort (Non-alcoholic beverages available upon request). Sumptuous Champagne Breakfast at Reef Restaurant which offers an extensive buffet selection. 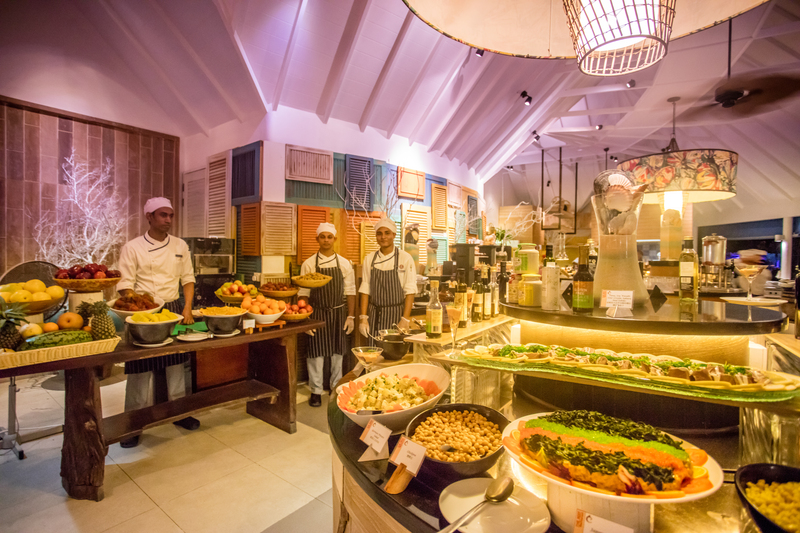 A choice of lunch venues, including our themed International buffets, Italian favourites at Azzuri Mare and Thai at Suan Bua restaurant. Afternoon tea/coffee at Coral Bar. They serve snacks such as cakes, scones and sandwiches. Evening cocktails for you to meet your fellow guests. Two bars to choose from serving a variety of beverages daily from 10 am to midnight. House pouring wines (red, white, sparkling and rose), beer, spirits, cocktails, soft drinks, tea, coffee and juices. Minibar that is replenished daily with red wine, white wine, snacks, beers, soft beverages. Complimentary Wi-Fi throughout the resort. 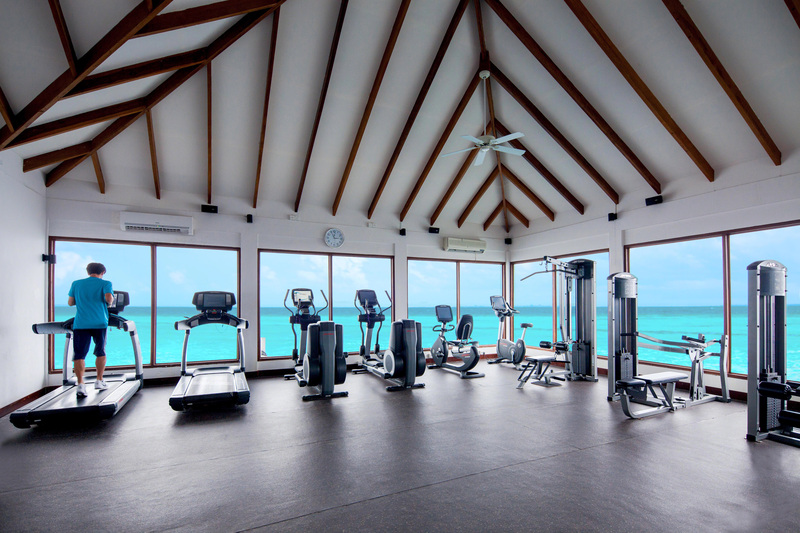 Complimentary use of our fitness centre, tennis and volleyball court. 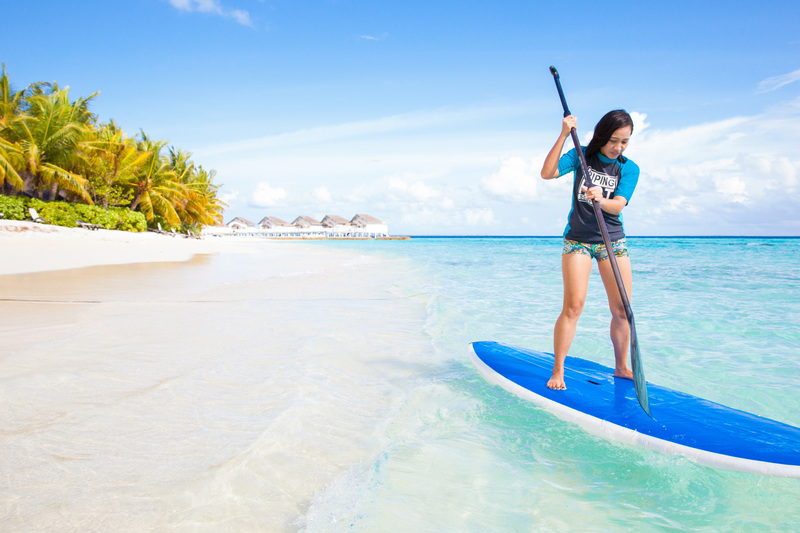 Complimentary activities in the resort include the use of snorkelling equipment, windsurfer lessons, speedboat tube or banana ride, canoes, paddle boats and catamaran sailing. Spa credits at Spa Cenvaree: USD 100/adult 30 minutes every day - can't bring forward (18 yo & above) for max 6 nights stay. Diving Opportunities: Guests can enjoy up to 3 dives per person per week as an alternative to spa treatments. 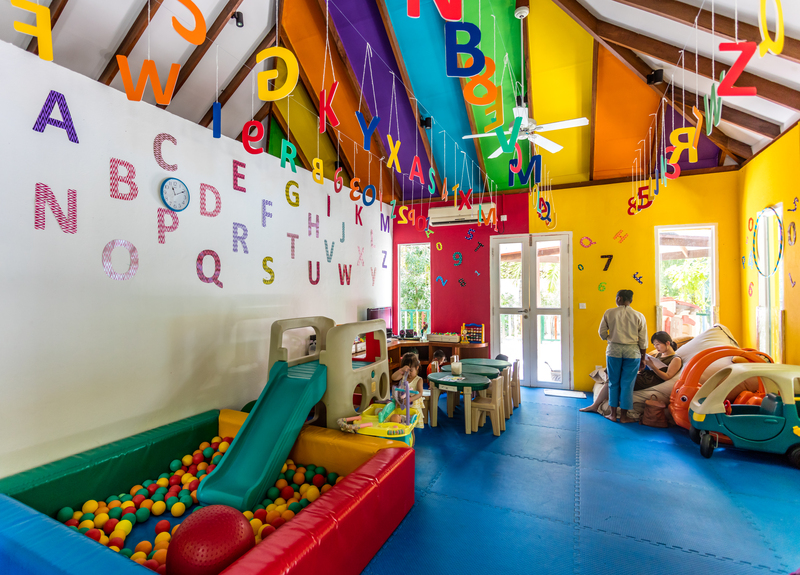 For the kids, the resort offers the E-Zone (entertainment and activities for teenagers and family) and Camp Safari (supervised activity programme for kids). 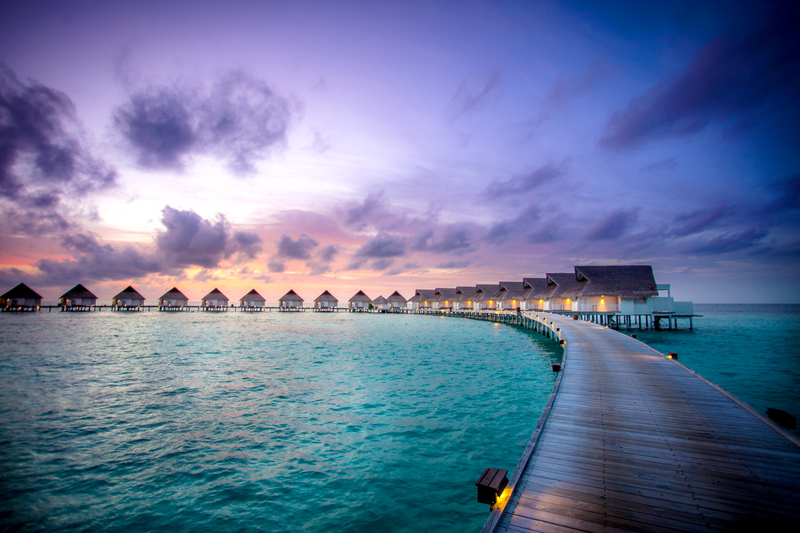 Surrounded by the blue ocean of the South Ari Atoll, and distinctive with its timbered walkways and colonial-style buildings, Centara Grand Island Resort & Spa Maldives is a barefoot paradise with a palm-fringed beach and shimmering lagoon that offers the perfect island holiday for everyone. 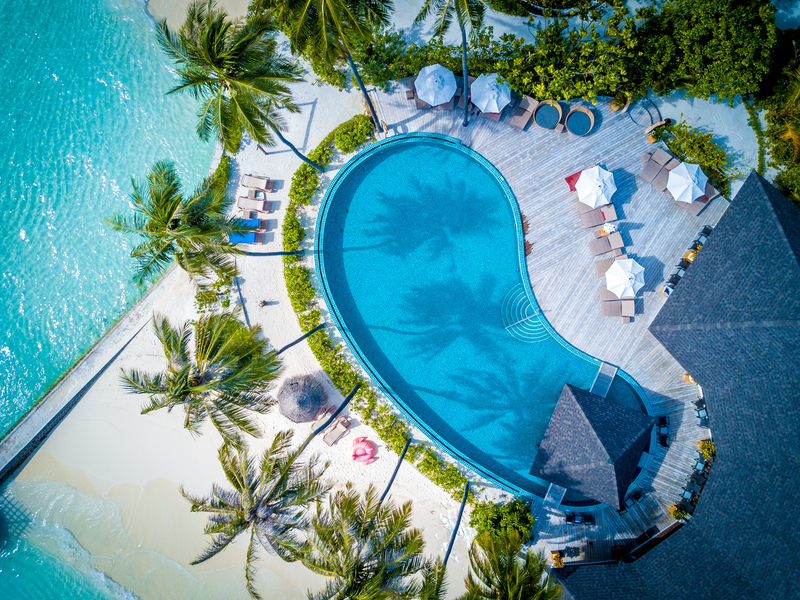 With 112 spacious villas set over-water, and suites blending harmoniously with the natural setting, the island has a wealth of activities and superb facilities that make this an ideal hideaway for couples and honeymooners, or a fun-filled destination for families. 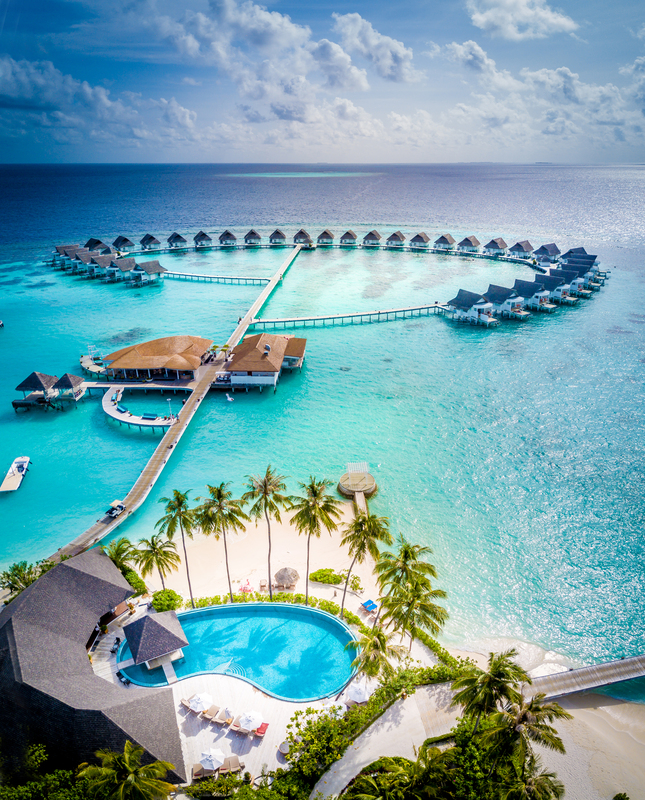 There are exceptional opportunities to discover the exotic life of Maldives underwater, with a house reef that is a kaleidoscope of colour for snorkellers, a shipwreck dive site just off the island, and easy access to some of the most famous dive sites in the world. 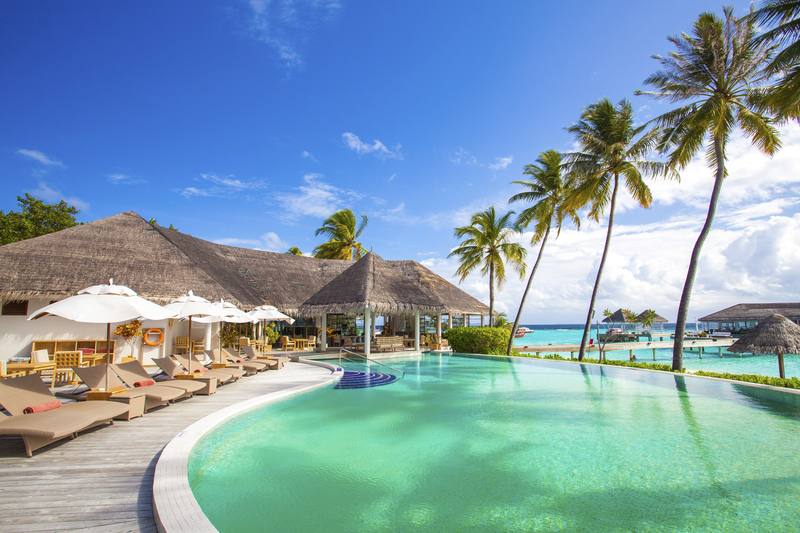 With our Ultimate All-Inclusive concept, your stay on our tropical island is absolutely carefree, with dining, rejuvenating, playing and exploring all included. 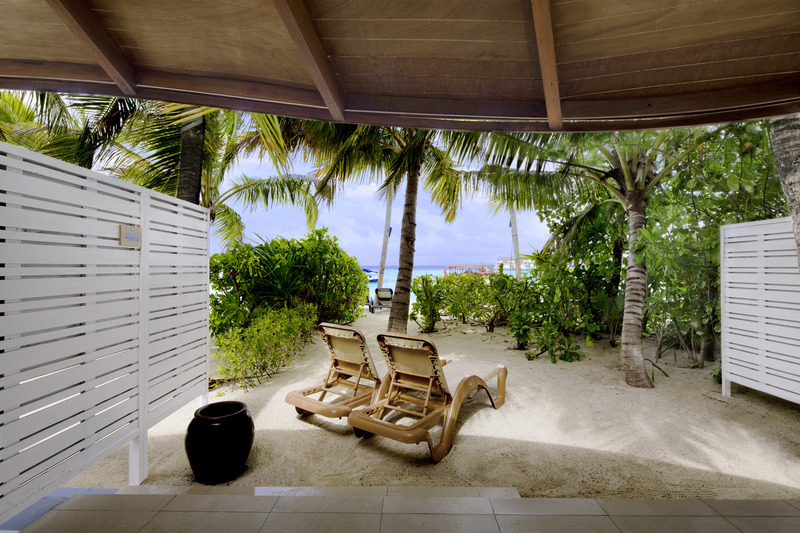 Take a walk on the white sand beach just outside your Beach Suite, and enjoy the turquoise waters of the lagoon. 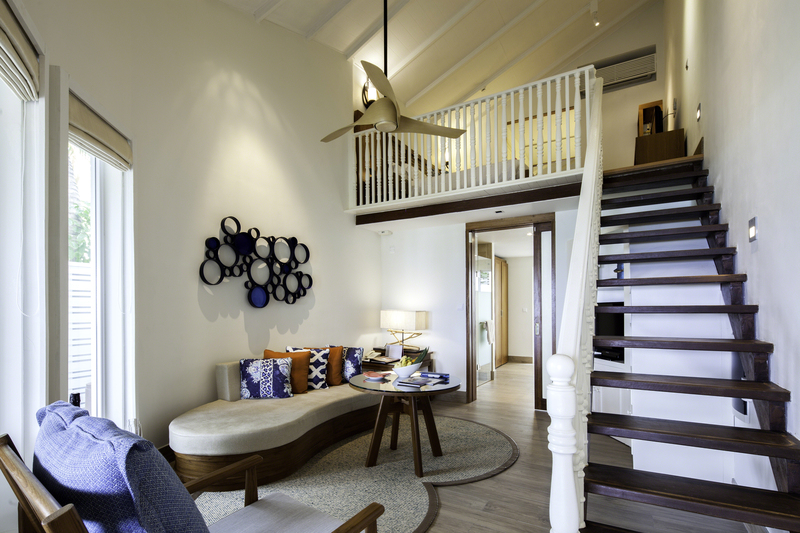 Our Beach Suites offer prime island living, where you can enjoy a spacious area of 87 square metres with a relaxing living room, a king bedroom on the mezzanine level, and an expansive bathroom with an outdoor shower. 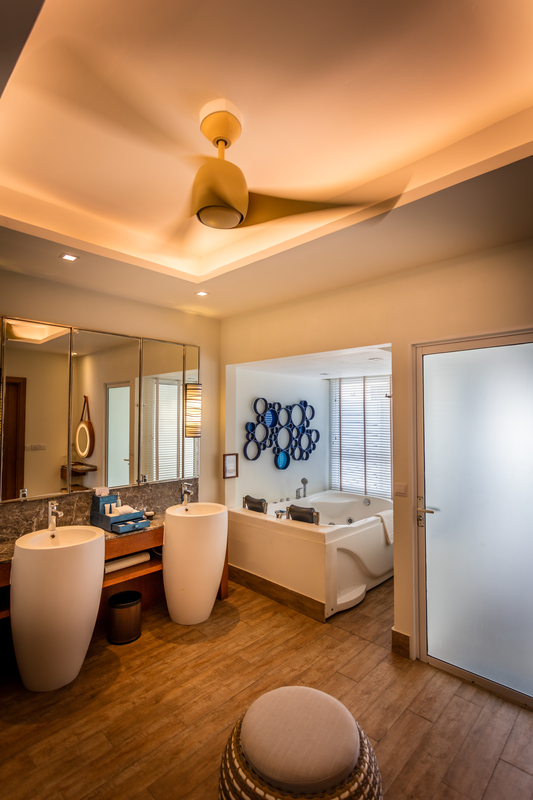 Light and airy with warm colours and inviting décor, the Beach Suites comfortably accommodate families of up to 3 adults or 2 adults and 2 children. 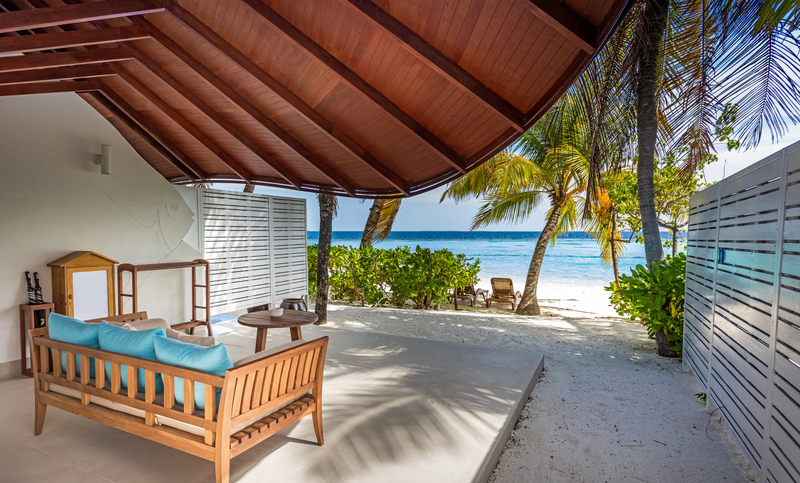 Open the door to the endless horizon, unwind on your private sundeck, or enjoy swimming and snorkelling in the warm lagoon. 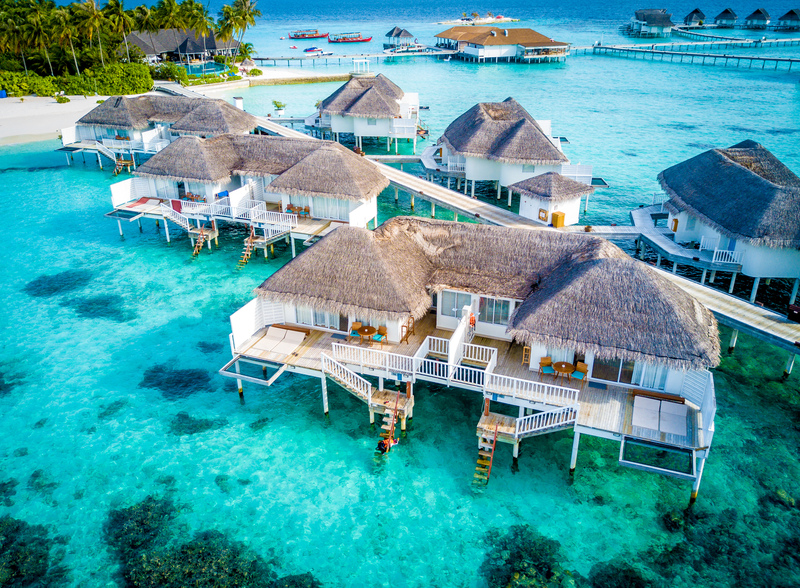 Set on the northern side of the island, the Deluxe Water Villas are spacious in size with a living area of 86 square metres, a soothing décor of white with splashes of colour, and rattan and hardwood furnishings. 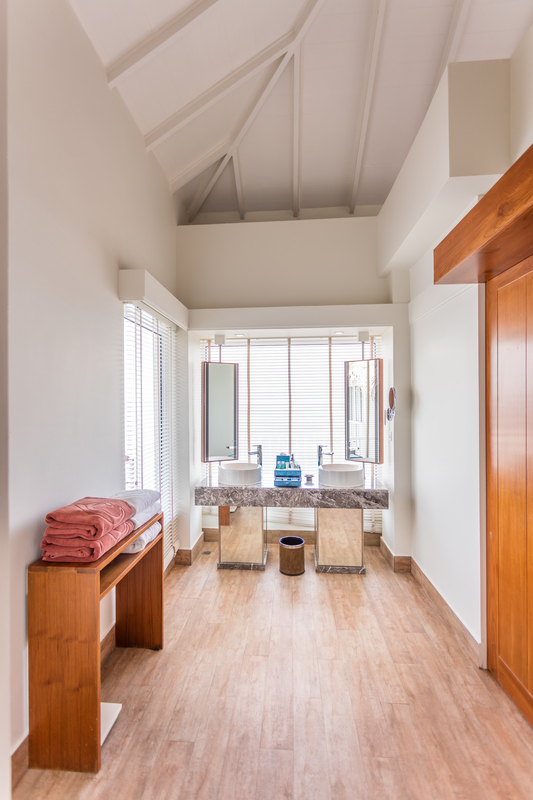 The villas, each with a king-size bed, sleep 3 adults or 2 adults and 1 child in comfort; and the bathroom features a shower and a bathtub with ocean views. 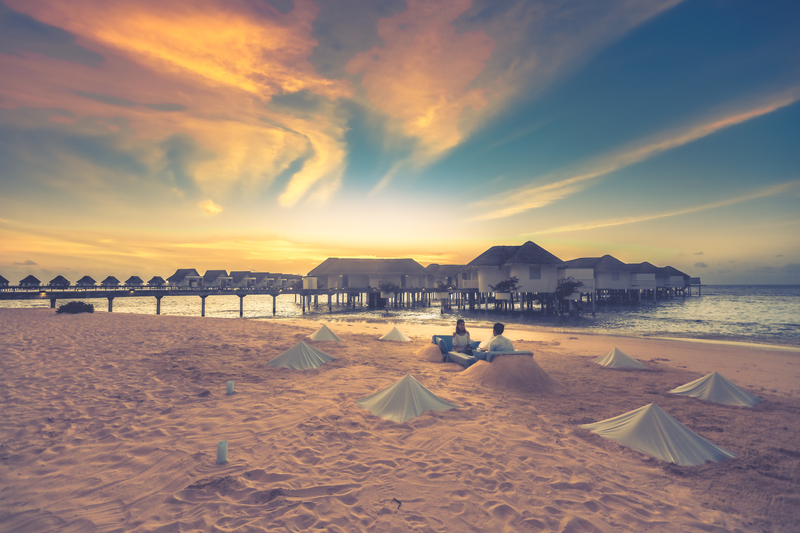 These family-friendly over-water villas are designed for the special needs of those with young children. 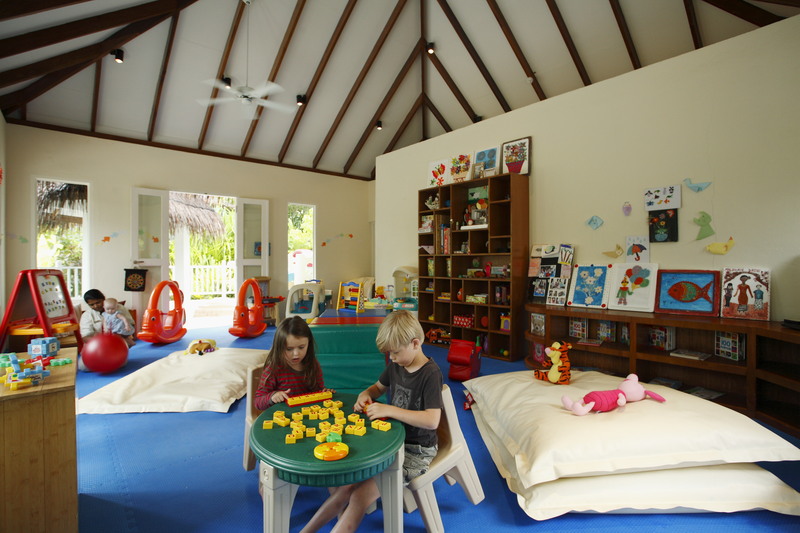 The villas offer 93 square metres of family space including a children’s sleeping area with bunk beds and PlayStation video games along with secured access to the terrace for the safety of the little ones. Bask in the glorious sunshine and enjoy unobstructed ocean views whilst lounging on your expansive terrace that has a flight of steps down to the lagoon. 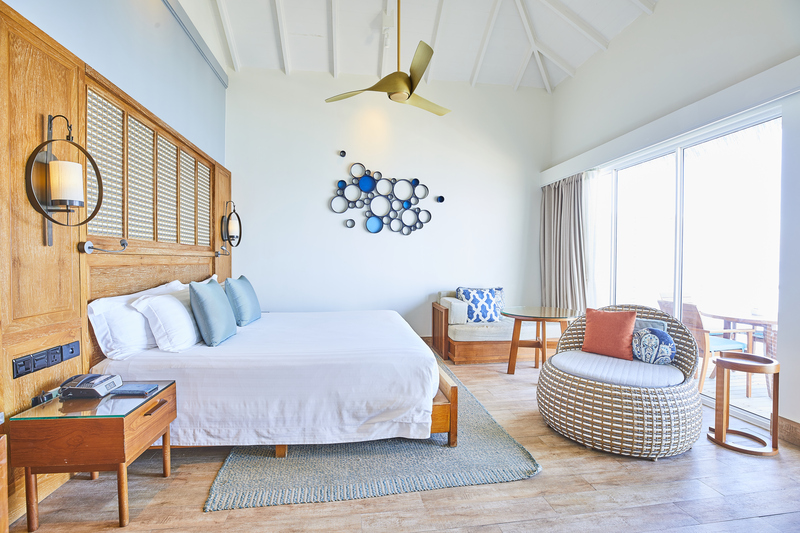 These spacious retreats on the southern side of the island can accommodate up to 3 adults or 2 adults and 2 children in comfort, and feature a king bedroom and a large bathroom with a shower and Jacuzzi or free-standing bathtub. Take in sublime views from these newly refurbished villas set on the western end of the island. 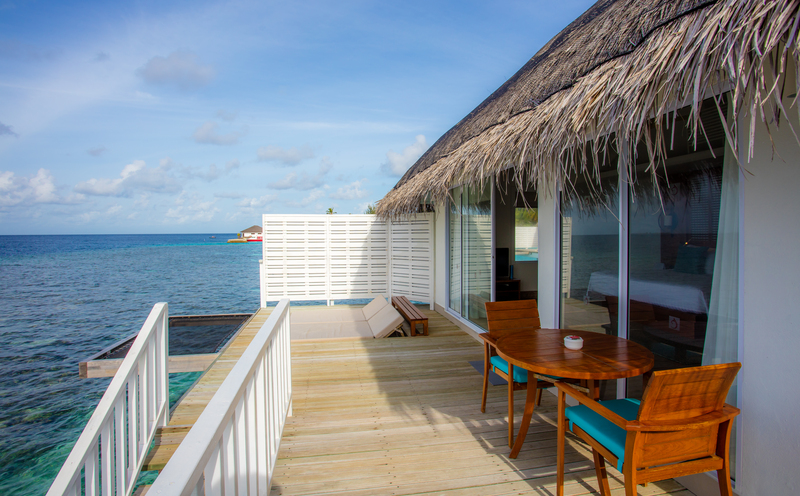 Designed for lagoon living, each villa has an ample terrace for lounging and basking in the sun, a sea-gazing bedroom, and steps that lead directly into the shimmering lagoon. 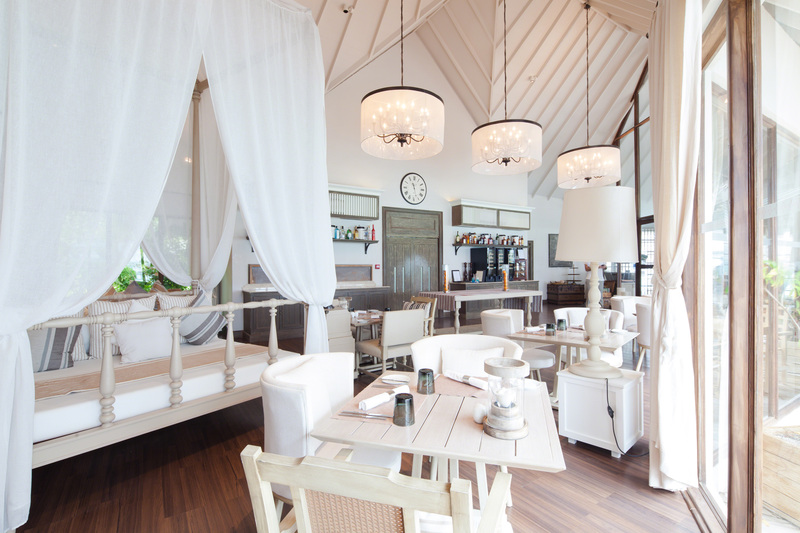 Abundant space is provided, with 110 square metres of total living area, including an outdoor terrace where our chefs can arrange a private dinner, and a spacious bedroom with high ceilings and dominated by soothing whites and rattan and hardwood furnishings. 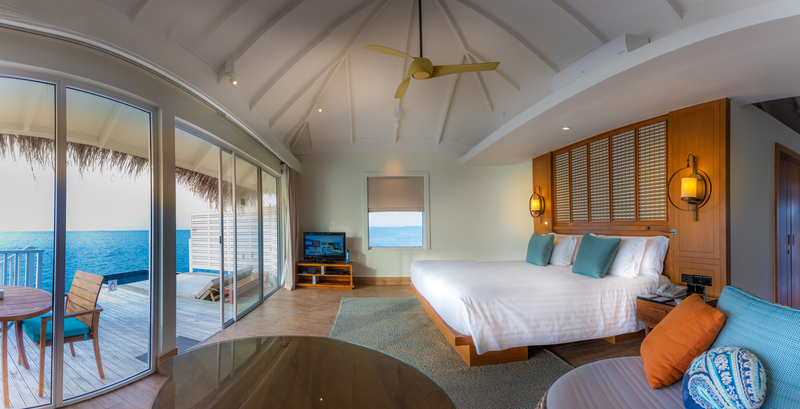 Perfect as idyllic villa hideaways, the Ocean Water Villas also accommodate families with a king bedroom sleeping up to 3 adults or 2 adults and 1 child, and an airy bathroom with shower and freestanding bathtub. 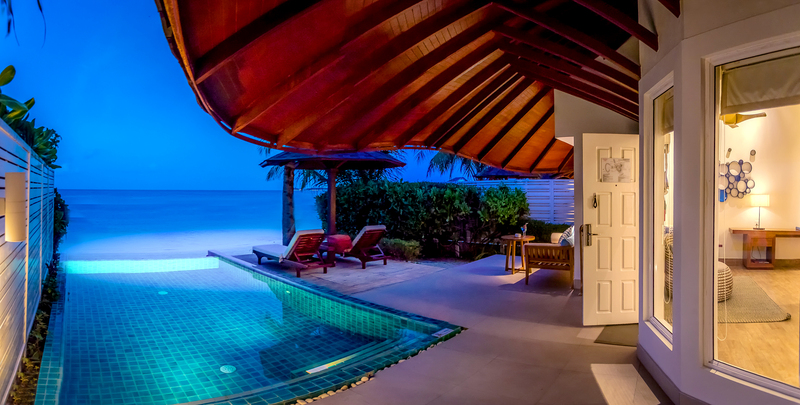 With white sand fringed by crystal clear waters just outside your Luxury Beachfront Pool Villa, you can indulge in barefoot luxury and enjoy abundant living space in your 159-square-metre villa, with its own plunge pool and terrace perfect for lazy days. Soft woods and white hues throughout the living area and the king bedroom on the mezzanine level create an inviting and relaxing environment. 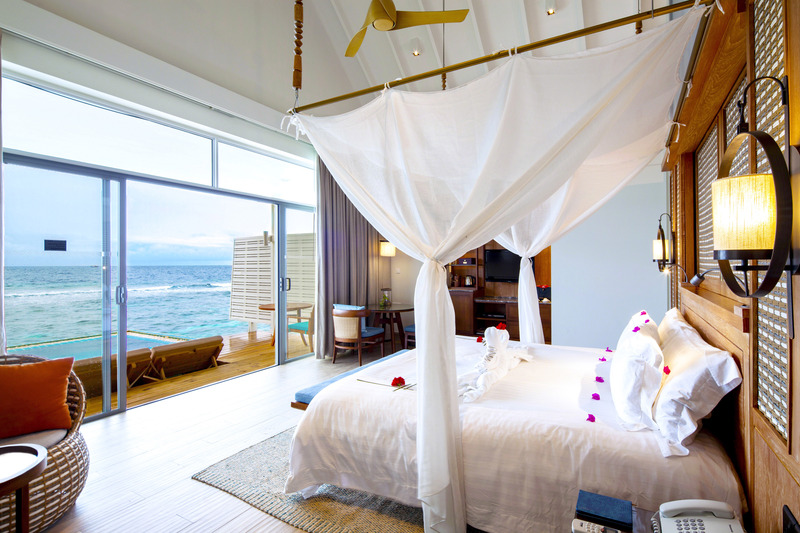 Ideal for couples and honeymooners, these retreats are designed for two adults and feature an airy bathroom with shower and indoor and outdoor bathtub. 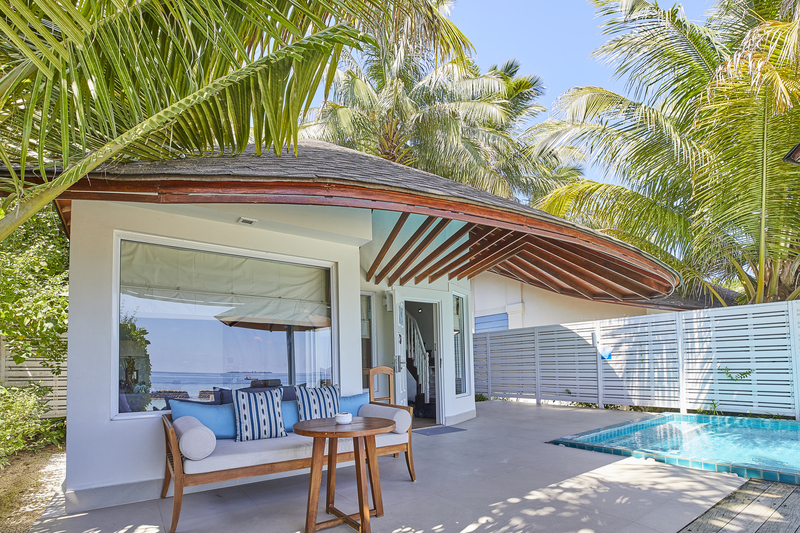 With fresh interiors that blend harmoniously with the natural environment and their own beachfront, these expansive 159-square-metre pool villas are ideal for families travelling to the Maldives with up to three children. 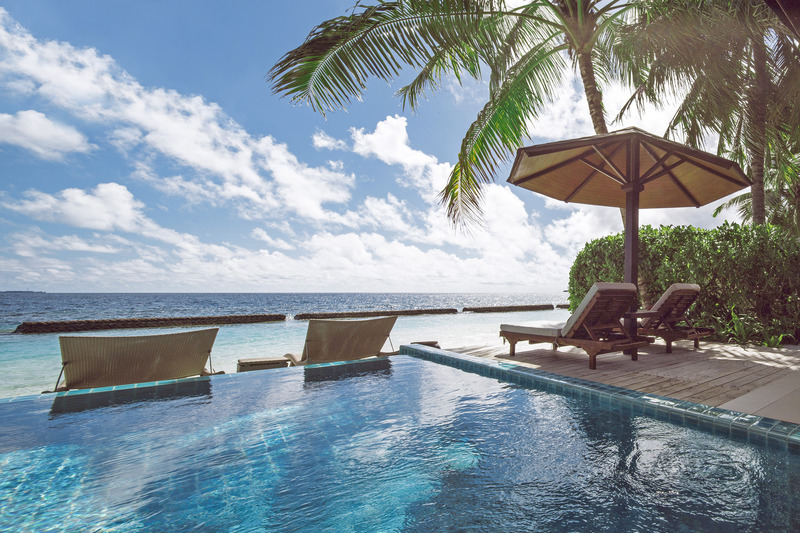 Each Luxury Beachfront Pool Villa Two-Bedroom is a tranquil retreat, a stone’s throw away from the shimmering lagoon and with its own plunge pool on the terrace for cool dips. 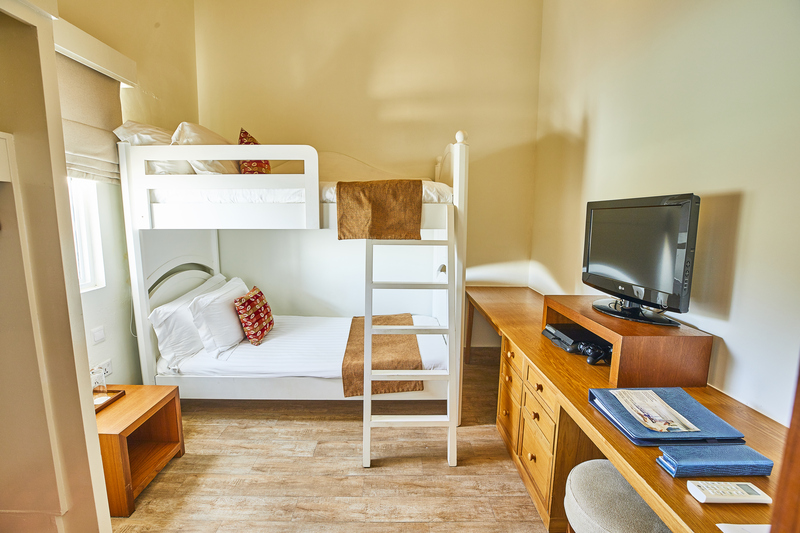 The spacious interiors accommodate up to 4 adults, 3 adults and 2 children or 2 adults and 3 children, featuring a relaxing lounging area, two bedrooms with the king master bedroom on the open mezzanine floor and the smaller bedroom with twin beds on the ground floor. The spacious downstairs bathroom has a separate bathtub and shower. 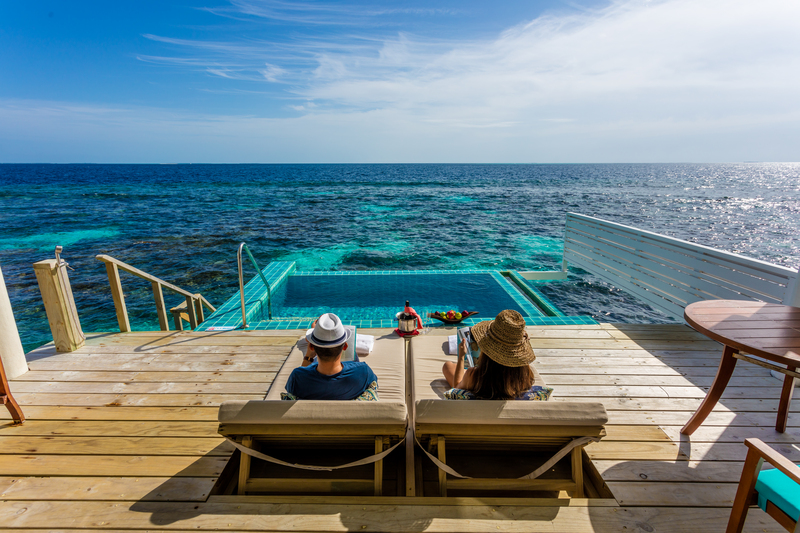 Cool off in your own 12-square-metre plunge pool with views across the ocean or enjoy fantastic snorkelling, only a few steps down from your terrace. 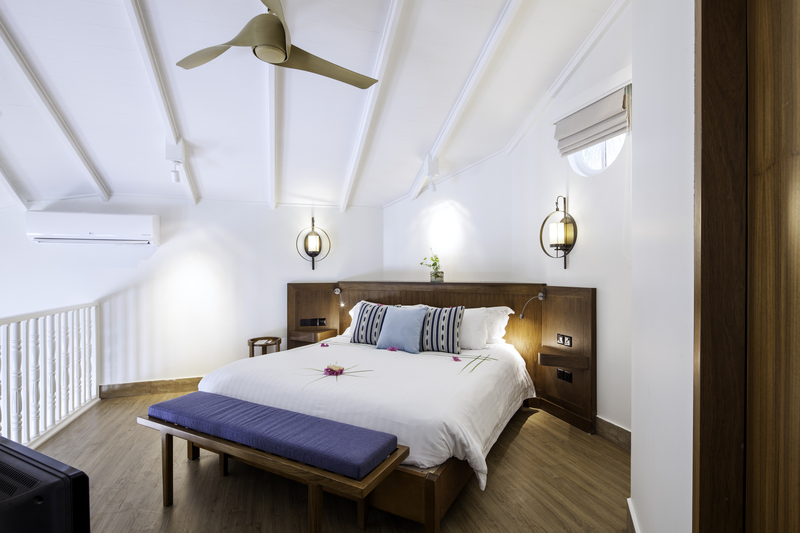 These villas on the western end side of the island feature an ample terrace for lounging and basking in the sun, a sea-gazing bedroom, and abundant living space of 110 square metres. 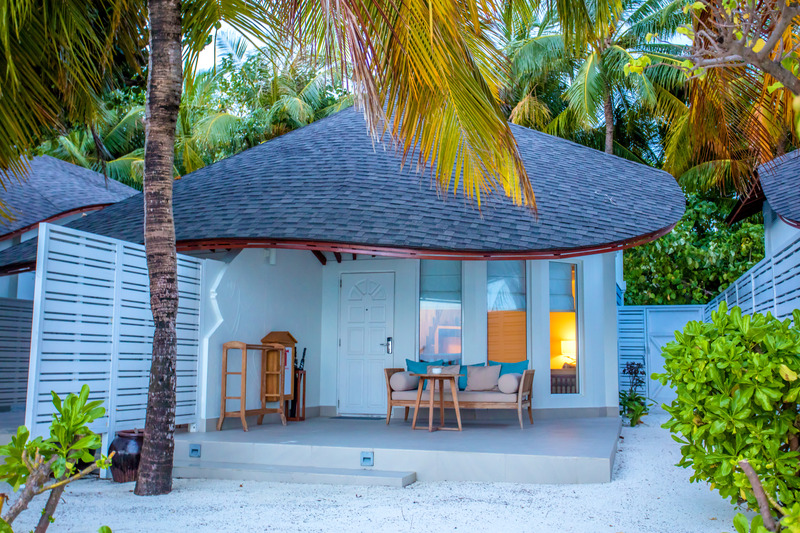 These idyllic villa hideaways also accommodate families and 3 adults or 2 adults and 1 child and feature a king bedroom and an airy bathroom with a shower and a freestanding bathtub. 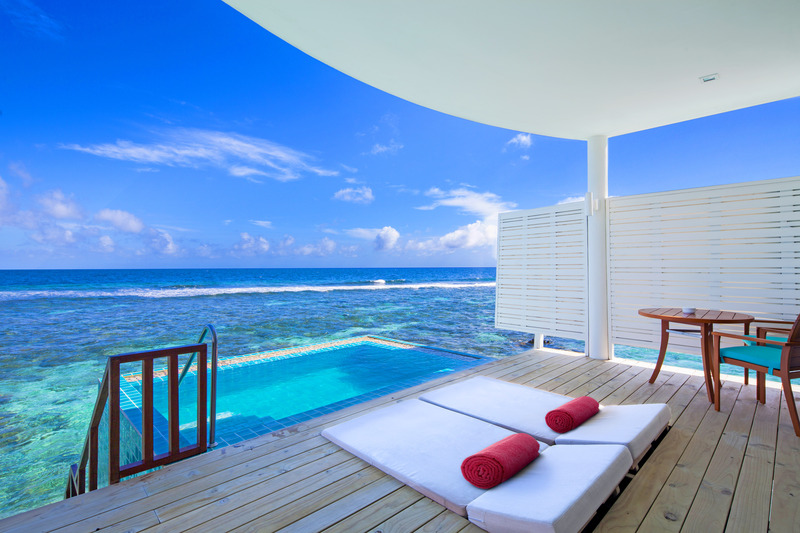 ** All Sunset Ocean Pool Villa guests are entitled to Club Benefits which include access to the exclusive facilities and dining options of the Club Lounge. 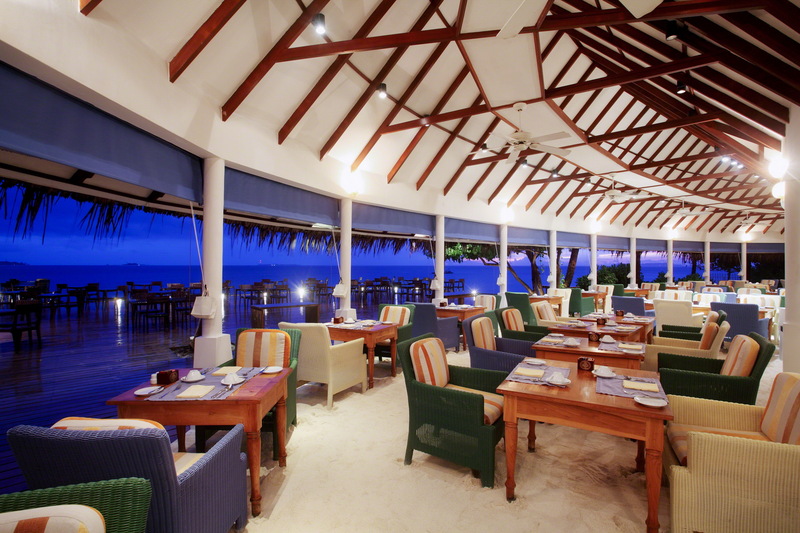 Next to the swimming pool and overlooking the beach, the Reef with its thatched roof is a classic island restaurant. Begin your day here with a champagne breakfast! Reef serves all three meals, each with an expansive and colourful buffet that features dishes with both Western and Asian influences. 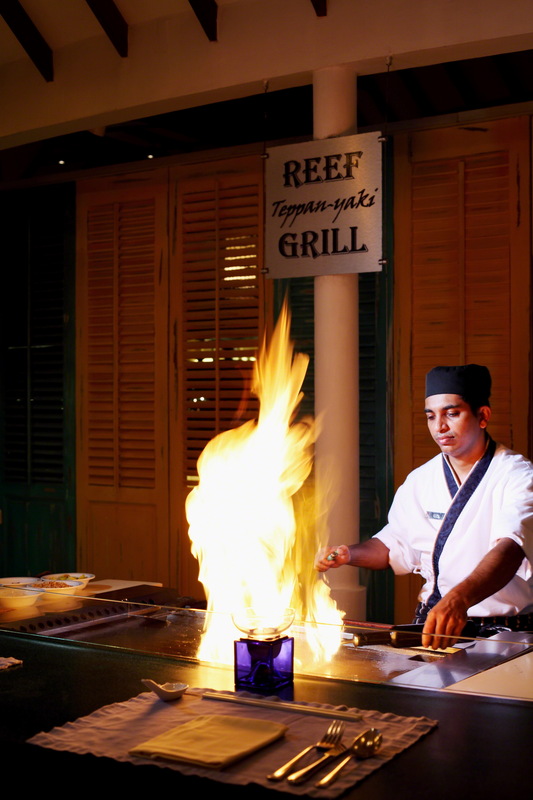 Live cooking stations and a Teppanyaki table add to the conviviality. Dining options for vegetarians are also available here. 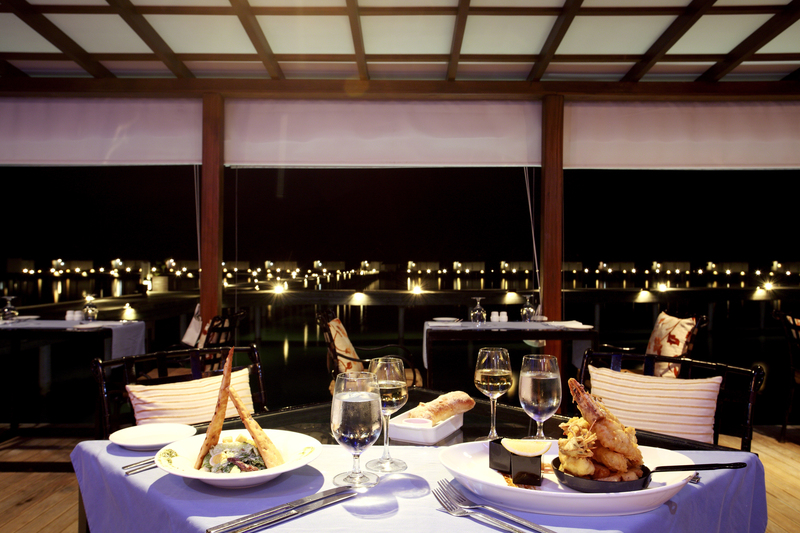 Over here, you get to savour the fresh catch of the day together with Italian signature dishes (flavour-filled pasta and pizzas), which is complemented by the dreamy views across the lagoon. 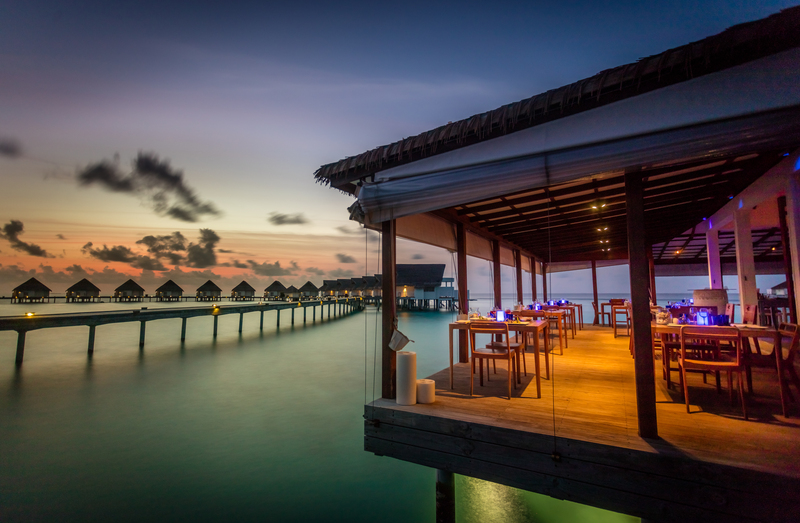 Along with its ocean views, the restaurant also provides plenty of visual action with its open kitchen, and a la carte menu and set menus which features vegetarian options. Couples and families alike will find Azzuri Mare an atmospheric spot to relax and unwind. 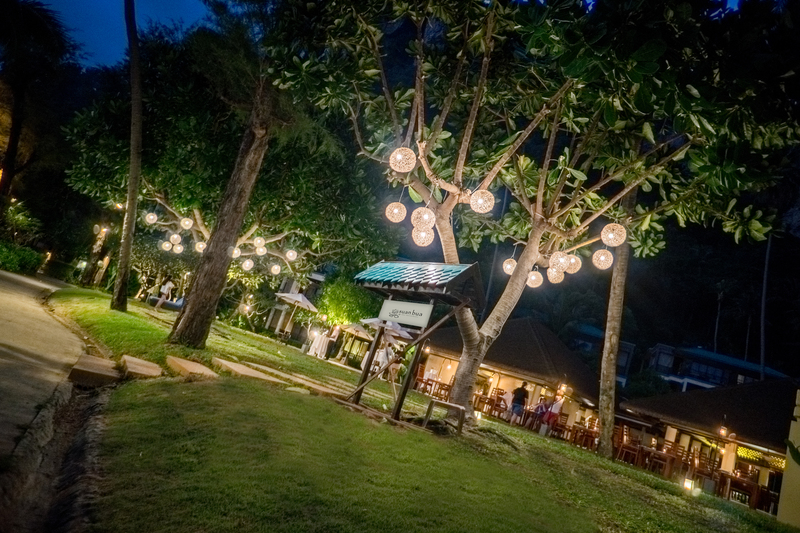 Set next to a lotus pond, and offering both indoor and al fresco seating, Suan Bua serves the tangy, spicy flavours of authentic home-style Thai cuisine. Our chefs recreate recipes from the four regions of Thailand with famous dishes like Pad Thai, Som Tam and Tom Yum Kung, and fresh fish and shellfish steamed, grilled or stir-fried and served with delicious sauces and dips. Vegetarian food is an important part of Thai cuisine, and creative vegetarian dishes are available. 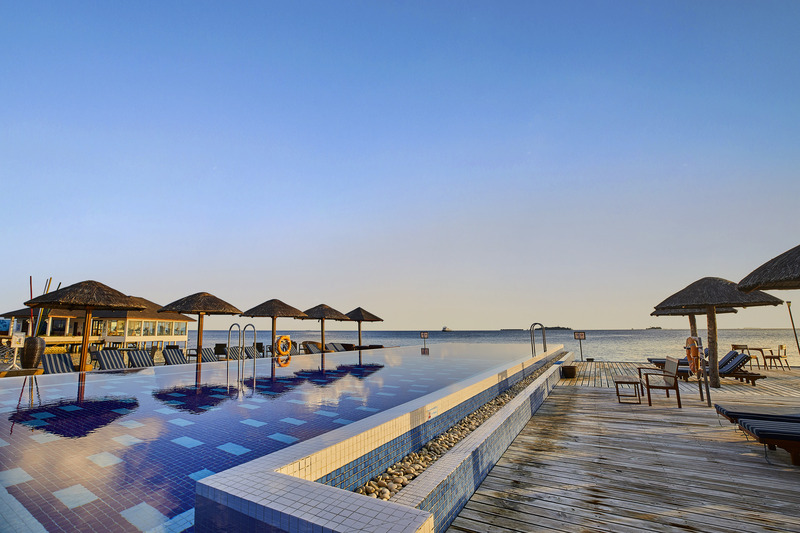 Take the short walk to Aqua, one the island’s best spots to lay back and admire spectacular ocean views and sunsets. Laze in comfort and tranquillity as you sip your favourite cocktail and enjoy light bites and snacks. 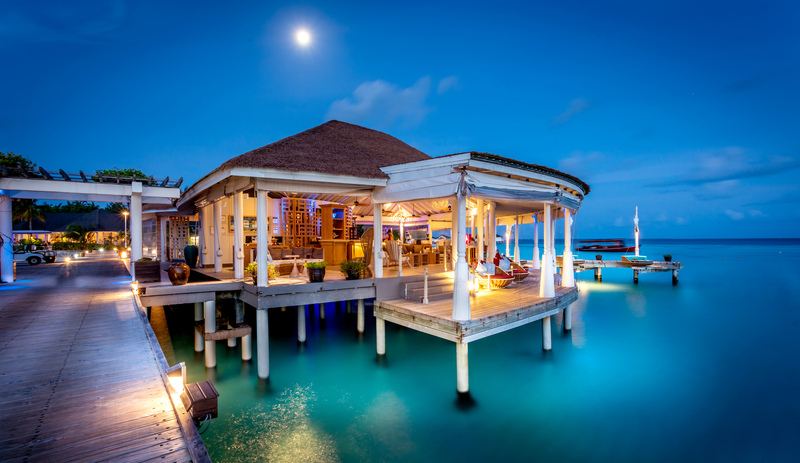 Set overwater, opposite Azzuri Mare on the western side of the island, Aqua is perfect for pre-dinner cocktails or a nightcap. Sundowner parties are held daily. 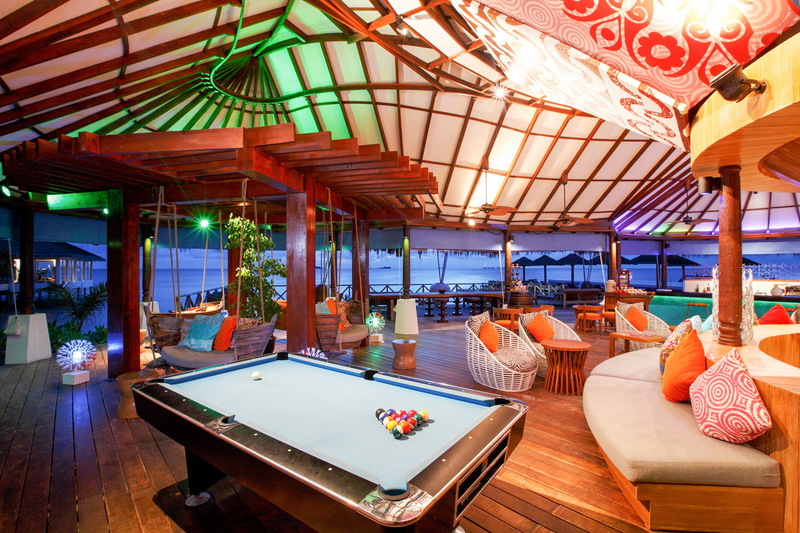 Experience one of the most entertaining lounge bars in the Maldives. 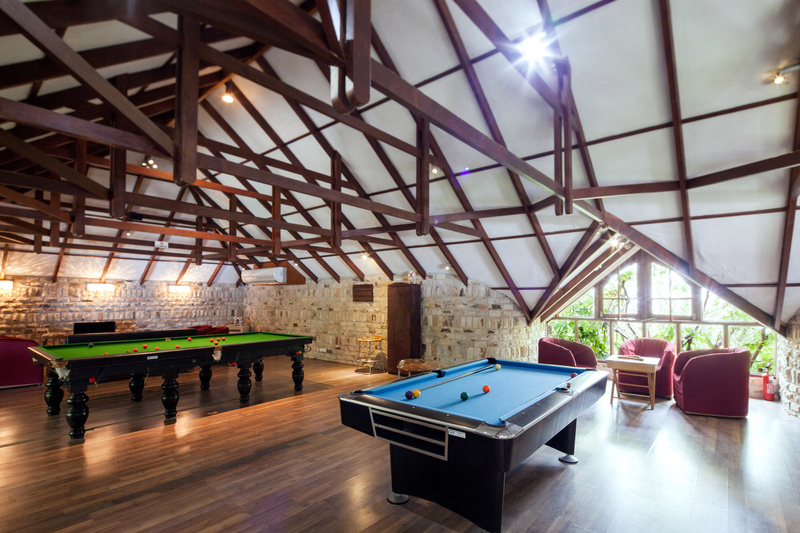 Built on two storeys, with pool tables and games on the mezzanine level and a casual sand-floor setting on the ground floor, Coral Bar & Lounge is located just off the swimming pool deck. Relax in style, indulge in our complimentary afternoon tea, or simply enjoy thirst-quenching drinks, wines, and cocktails at any time of the day or night. Kids will love our daily afternoon ice creams. 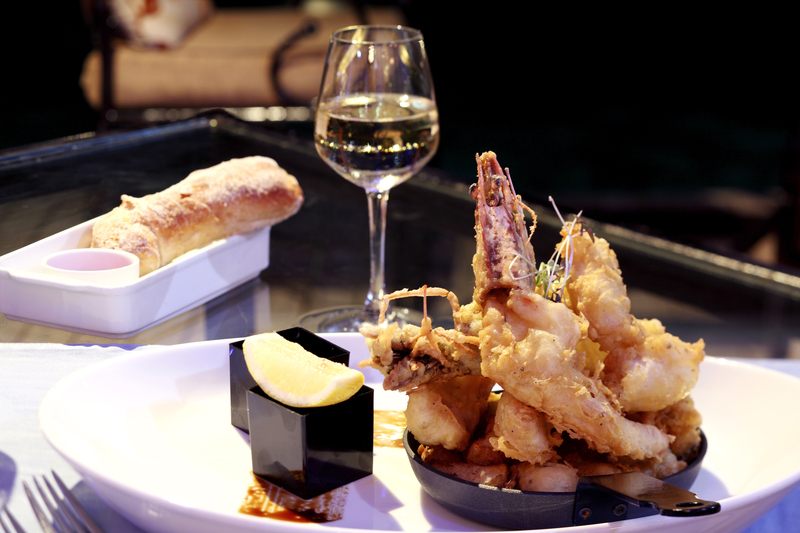 Those longing for an extra touch of indulgence will enjoy dining in the exclusive setting and convenience of The Club. 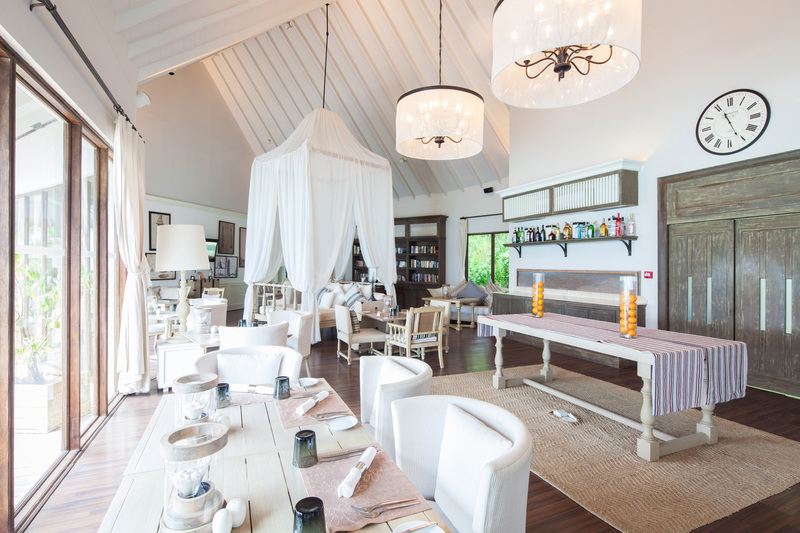 Designed as a secluded and intimate retreat for our Club guests, The Club serves a la carte breakfast, nutritionally balanced light lunches and five-course dinners with the option of a private, candlelit setting. Premium spirits and wines are served with our compliments throughout the day, along with refreshments and tea and coffee. * Club benefits and exclusive access to the Club Lounge are available for guests staying in a Sunset Ocean Pool Villa or at a supplement. Sometimes it’s just easier to stay in the lap of luxury and have dinner brought to you. Dine on Thai delicacies or a choice of international dishes in the comfort of your own beach suite or villa, available any time of the day or night. Each guest can enjoy between USD 100 and USD 400 credit per stay to redeem at SPA Cenvaree. Relax like never before, indulge in sheer pampering and emerge rejuvenated at Spa Cenvaree, our oceanfront sanctuary for the senses. 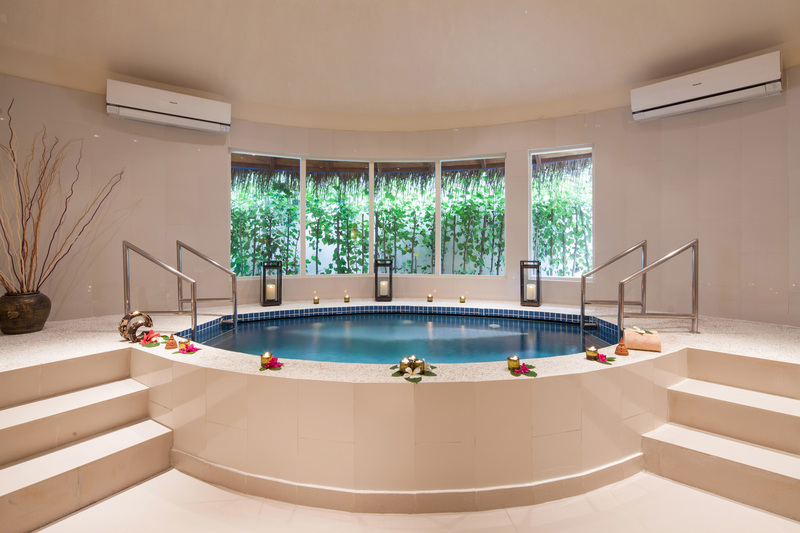 Enjoy daily treats at the spa with the resort’s Ultimate All-Inclusive experience. Each adult guest receives credits to redeem for a choice of body scrubs, and massages including foot massage, Indian head massage, facial massage and upper back massage. 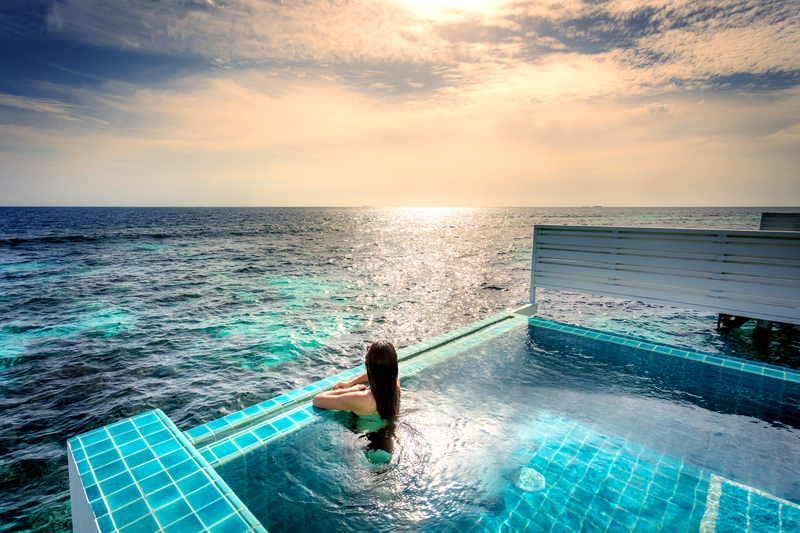 There are suites for singles and couples, along with an outdoor overwater venue dedicated to Thai massage, facilities for Vichy hydrotherapy and hot and cold plunge pools. 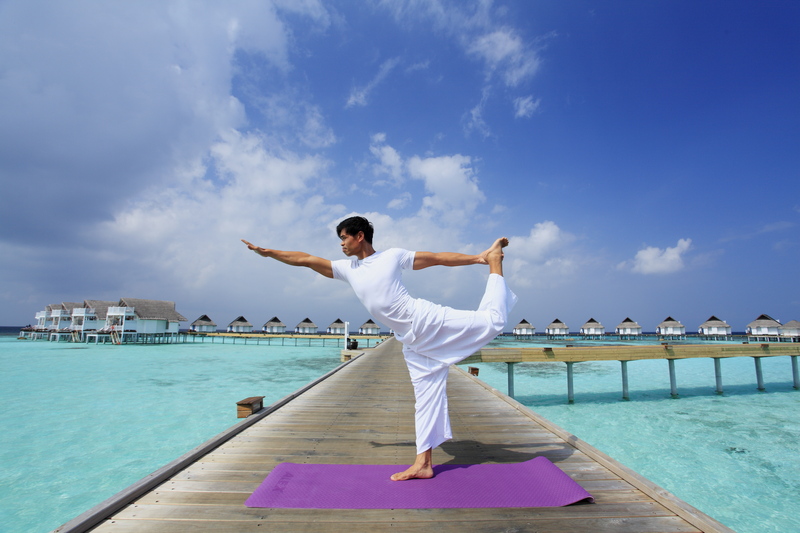 Scheduled yoga sessions are available beachside and at the fitness centre. 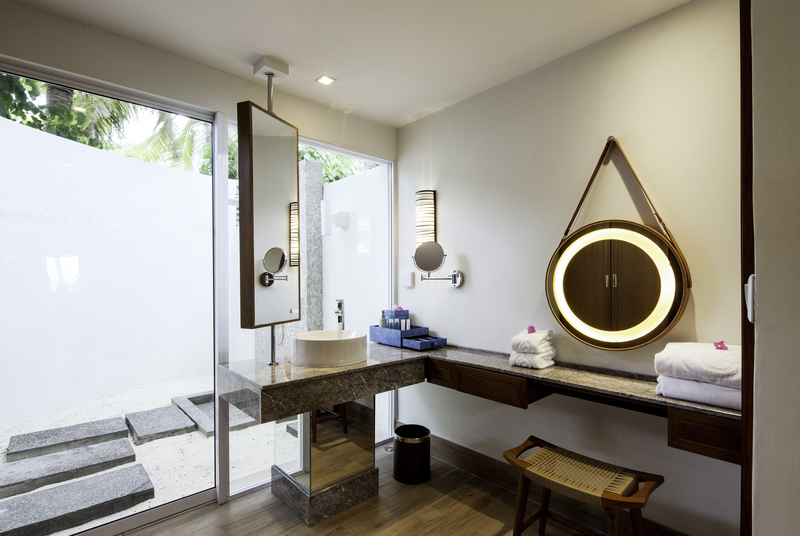 Treatments inspired by Ayurvedic and Thailand’s well-being heritage and modern rejuvenation practices, along with couple spa journeys, are available from a full spa menu. Visit the Spa Cenvaree website for reservations and for more information on our signature treatments. 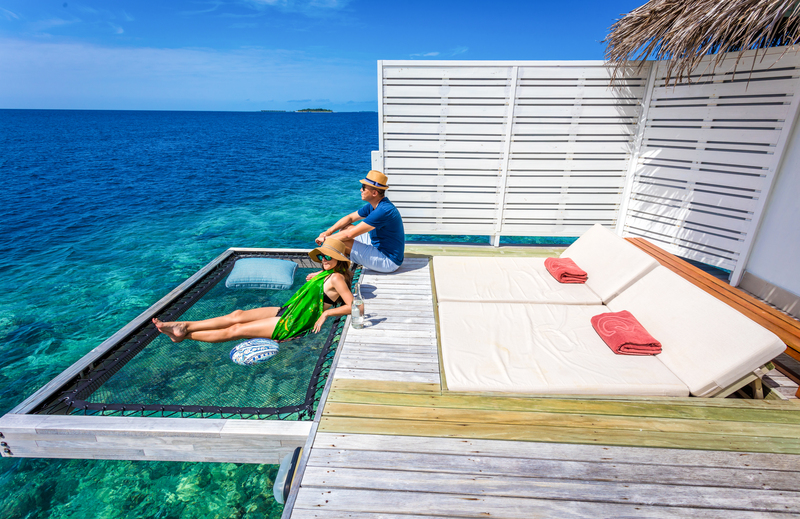 The resort’s lagoon and coral reef provide a glimpse into a fascinating undersea world that can be experienced by snorkellers, even the very young ones who will thrill to the close-up view of exotic and colourful marine life. Within the lagoon, easily reached from the villas, is our coral garden in which we are growing new coral that is then transplanted onto the reef to replace old coral that has died. 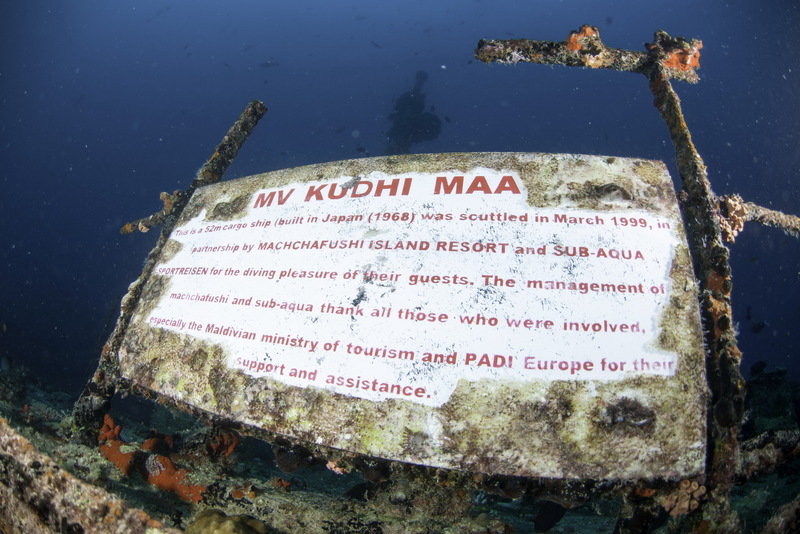 Scuba divers will be able to explore the wreck of the Kudhimaa, a cargo ship that was deliberately sunk to provide a home for marine species. There is easy access for divers to the cargo holds, and the wreck is home to schools of batfish, puffer fish, boxfish and large lionfish. Extraordinary underwater visibility and exceptionally varied marine life mean that scuba diving does not come better than at the Maldives. Our island has its own PADI dive centre, where our expert team will coach beginners or help the more experienced divers to hone their skills. Diving trips are arranged to some of the best dive sites in the Maldives, where you will be able to explore vast reef formations, thrilling channels, undersea hills, coral-filled thilas and caves, and swim amongst a huge variety of colourful fish. 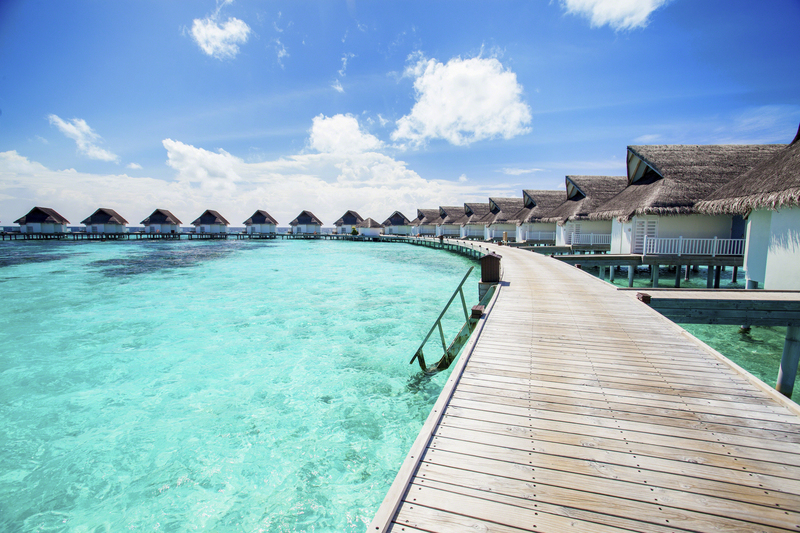 If diving isn't your thing, then you can replace it with spa credits! 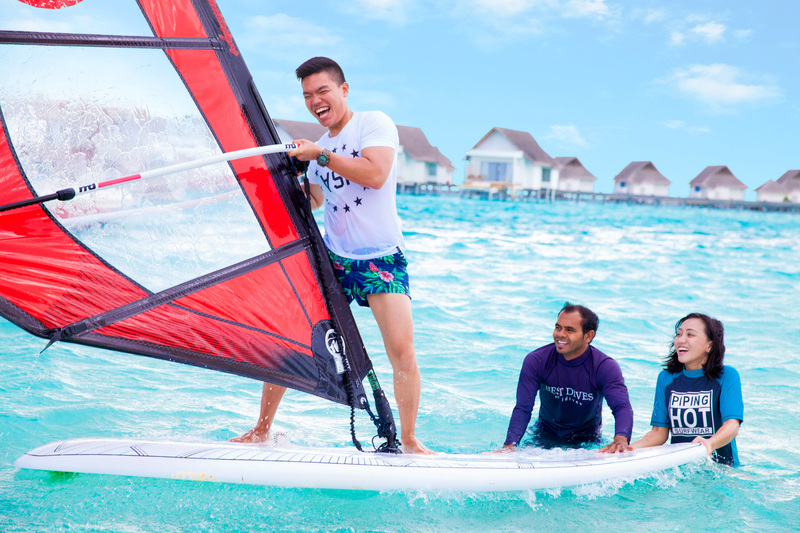 It is our aquatic mission to offer a varied range of water sports, and we have options for guests of all ages and preferences, with windsurfing, sailing, snorkelling, canoeing and pedal boats amongst the attractions. Snorkelling is a wonderful and easy way to glimpse the varied life beneath the waves, and if you are unsure of venturing out on your own, our team will be happy to teach you. 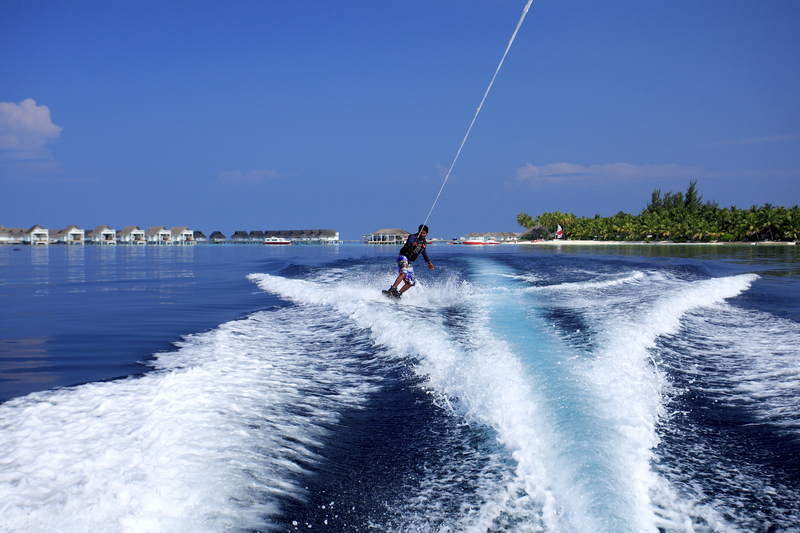 Non-motorised water sports are included in the Ultimate All-Inclusive programme, while the motorised water sports and wakeboarding are provided at a supplement. 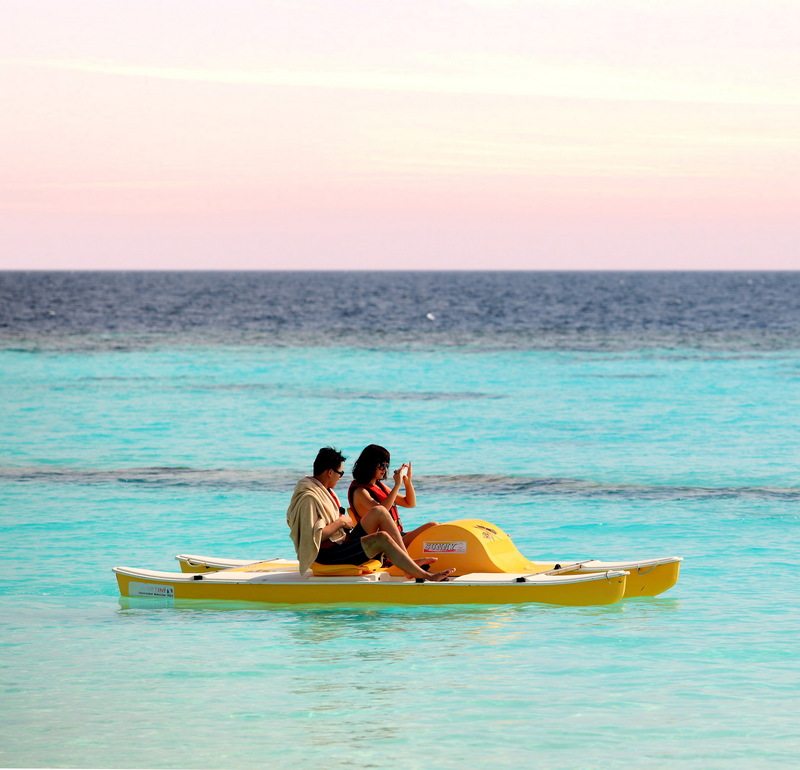 The Ultimate All-Inclusive includes a number of off-island excursions, each of them bookable once per guest per stay. Snorkelling tour is an easy way to become acquainted with marine life and is suitable for the whole family, youngsters included, who will be dazzled by the exotic and colourful species, ranging from parrotfish to turtles and manta rays. 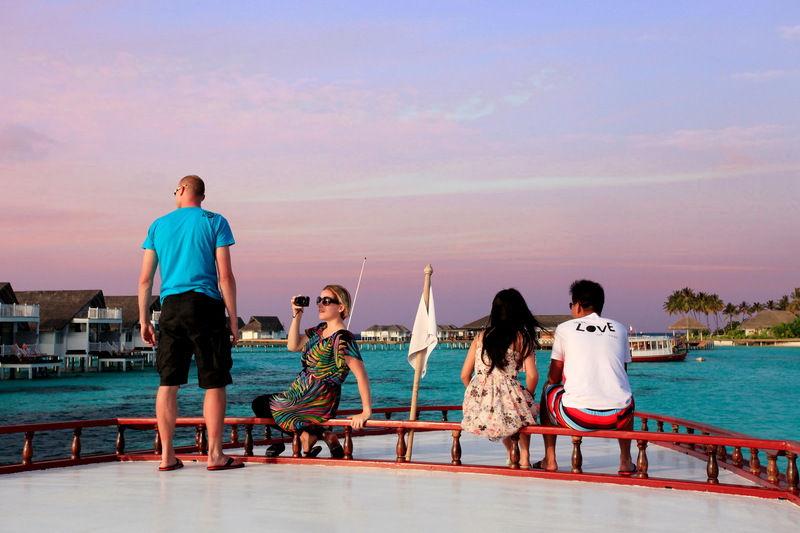 Our traditional dhoni cruise through the calm and azure waters while the sun sets in a blaze of glory, and champagne and canapés are handed round to the voyagers, is not to be missed. 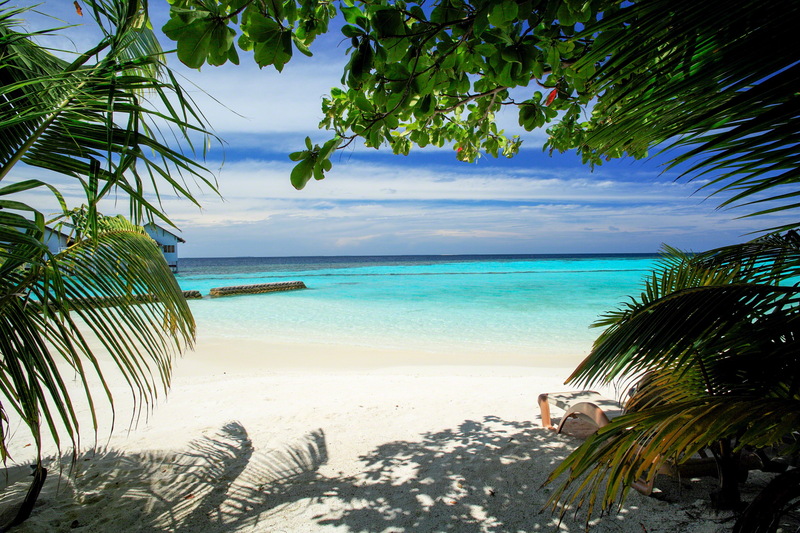 Your dhoni sets sail for a nearby island upon which villagers live in traditional style by fishing, and where you can buy handicrafts and clothing as a memento of your holiday. Sunset fishing: Our traditional dhoni cruises out into the sunset for a spot of hand-line fishing. 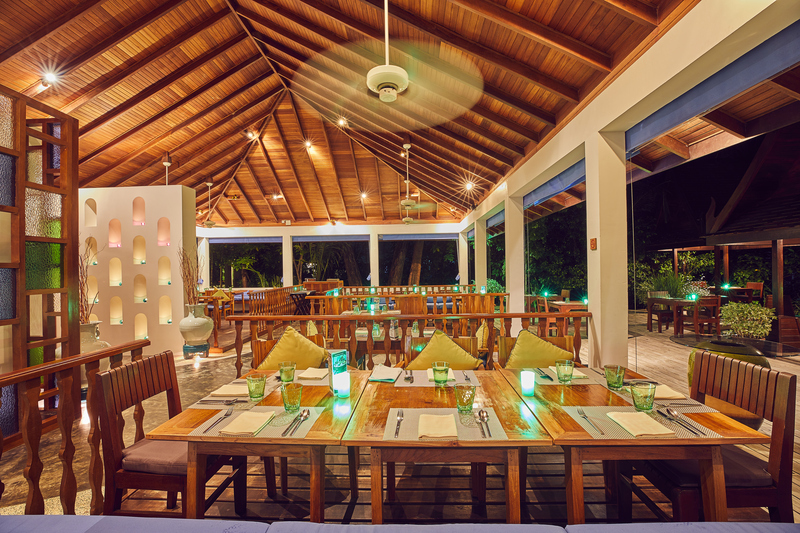 If you are lucky and catch your own fish, the resort kitchens will happily prepare it for your dinner. 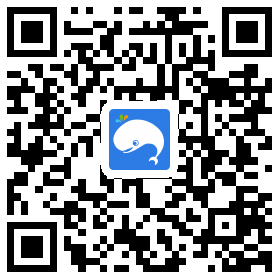 Dolphins and whale sharks can be seen on our whale shark trip, and on some occasions, it will be possible to swim alongside the gentle giants. 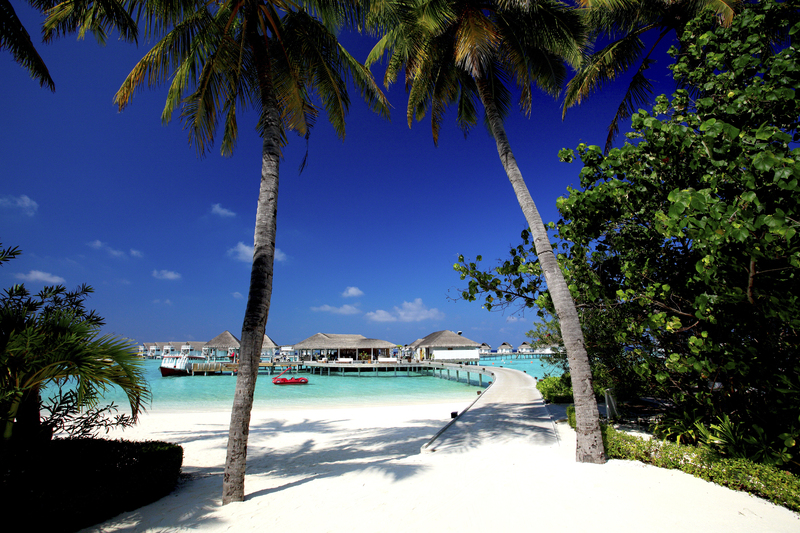 An island lifestyle and a colourful history are to be found at Malé, the capital island of Maldives. Here, you can see heritage architecture such as the Friday Mosque and the presidential palace, little streets and lanes lined with ancient houses, and colourful local markets, each bustling with life and colour. Malé is a fascinating shopping destination, and part of the fun is sampling local delicacies at the numerous teashops and cafés that dot the island. 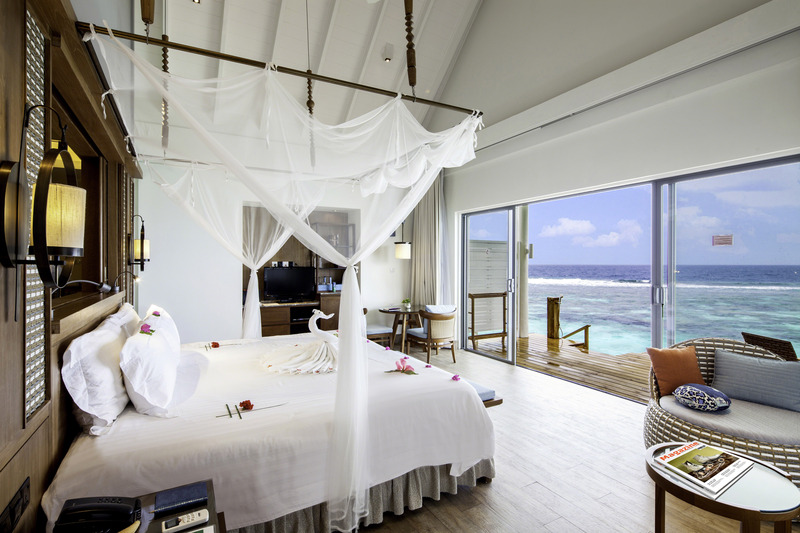 All rooms come with a view of the sea but take note that some rooms may not come with a full view of the sea. 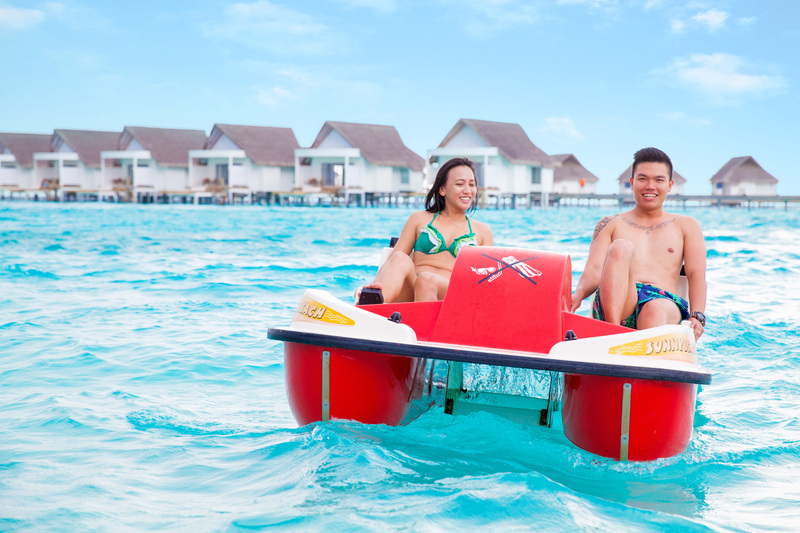 The flight duration from Velana International Airport to Villa Airport Maamigili is 20 minutes while the journey to the resort is a 15-minute speedboat ride. 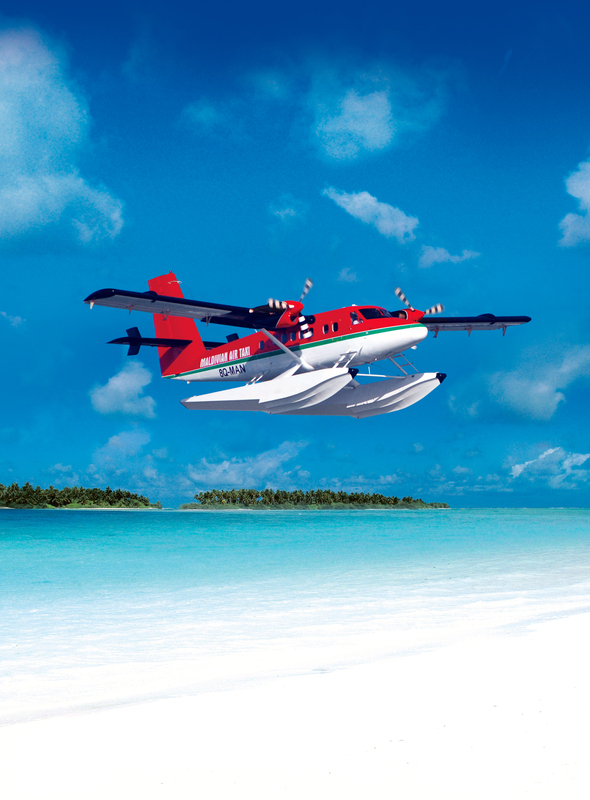 If you opt to take the Seaplane, there will be an additional cost of SGD 250/adult and SGD 150/child. The package is inclusive of breakfast, lunch and dinner (including beverages - alcohol). The excursion is also included in the package. For the meals, guests can request for no pork, no lard or vegetarian food. Floating breakfast is available at an additional cost. Special Gift can be provided during birthdays and special occasions. 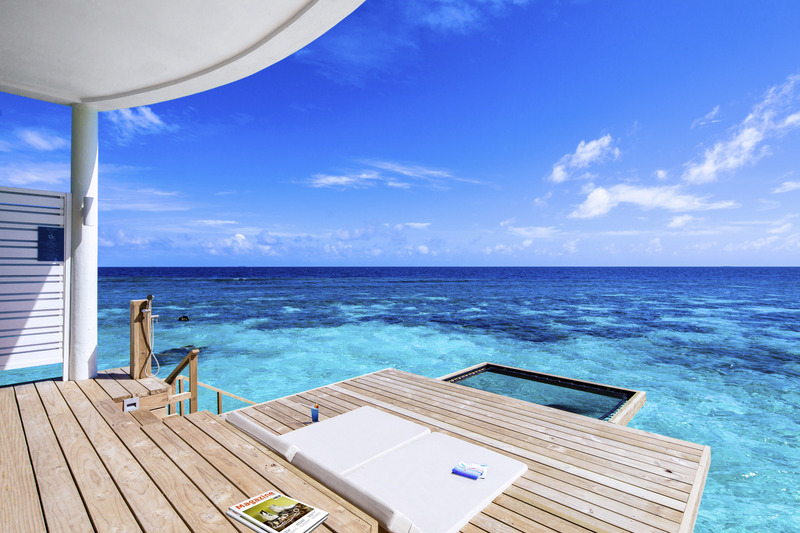 All villas come with bathtub except for Beach Suite. Prices are only applicable to all flights departing from Singapore/Malaysia and are not applicable for flights departing from China. The option to exchange Spa Credit for Diving is applicable to adults that are 18 years old and above only. Each guest is only entitled up to 3 dives per week, limited to one dive a day. The 3 dives include an orientation dive and 2 regular dives. Each dive, including the orientation dive, is limited to 45 minutes. Every participant must be a certified open water diver (or higher) and they must also undergo the orientation dive prior to the first scheduled dive. The final dive should be completed 24 hours prior to departure from the resort. Dives are subject to weather conditions. 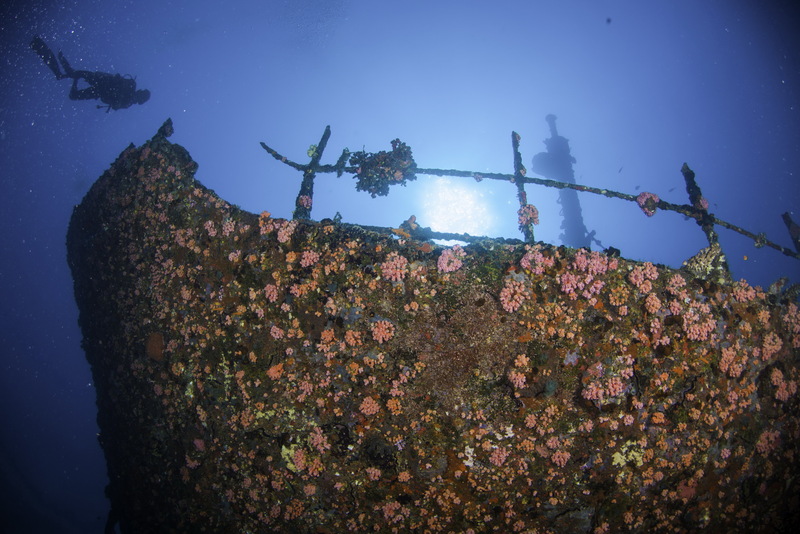 Stay 7 nights and get 3 dives included. Stay 5-6 nights and get 2 dives included. 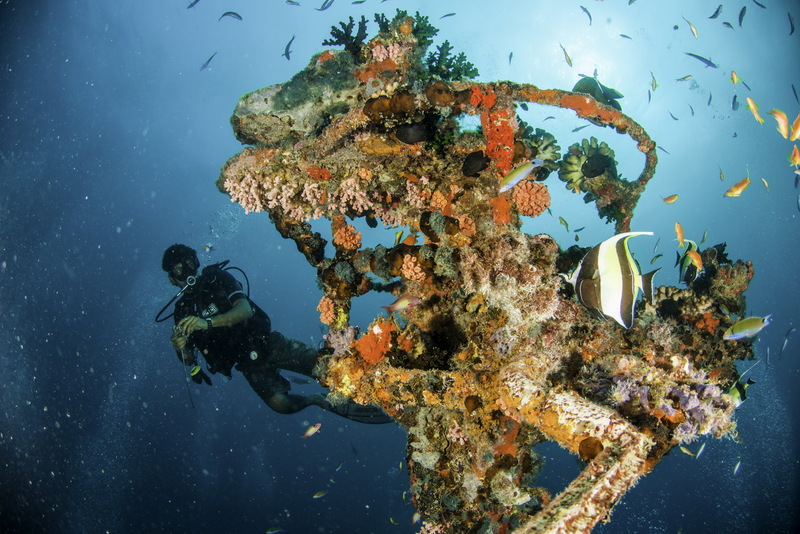 Stay 4 nights or less and get 1 dive included. 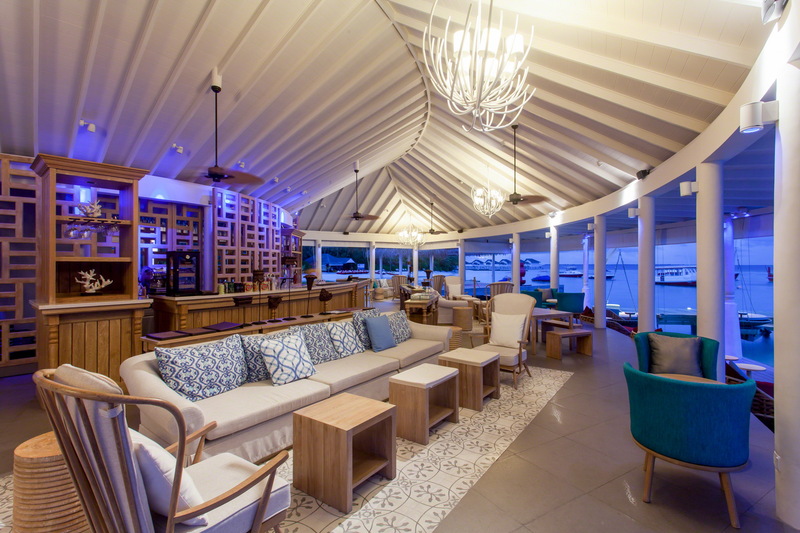 Club Benefits: The Club guests get to enjoy benefits such as exclusive access to the Island Club with indoor and outdoor private lounges, free form swimming pool, premium dining venue for breakfast, lunch and dinner. 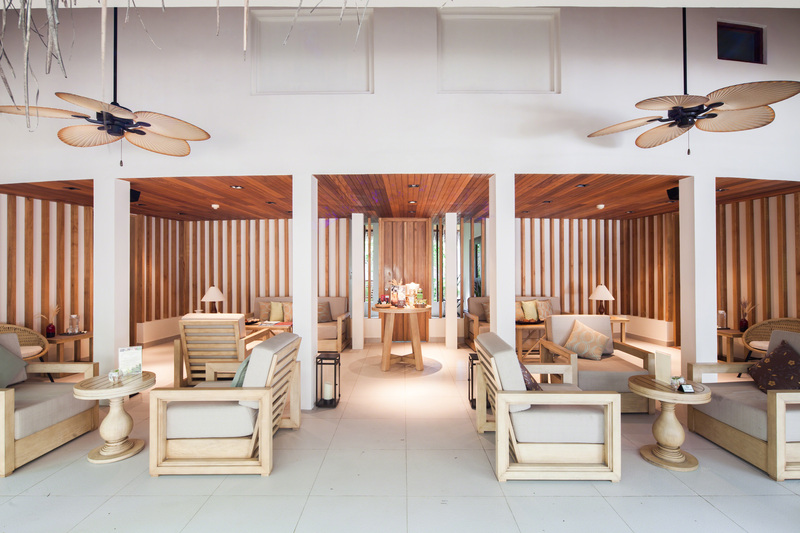 Club access is complimentary for guests staying in Sunset Ocean Pool Villas. 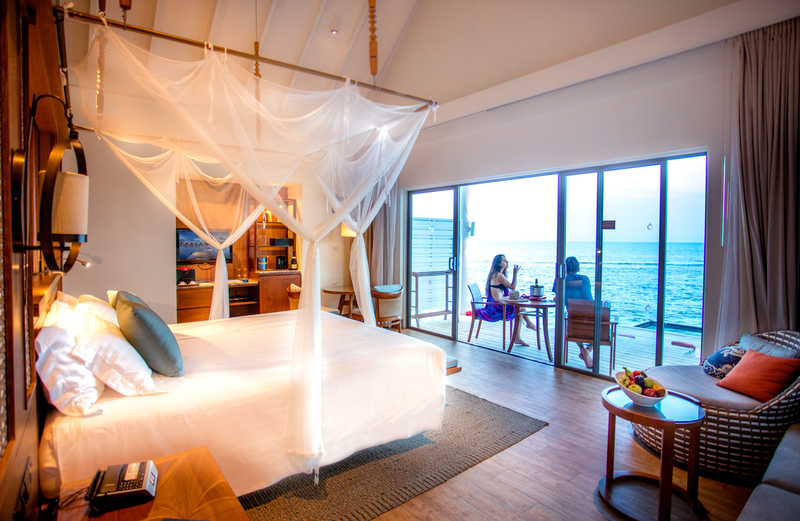 Honeymoon Offer: Honeymoons must be conducted within the year of the wedding or within 12 months of Wedding date. Wedding Certificate is a must at the time of booking and a copy is to be presented upon check-in. 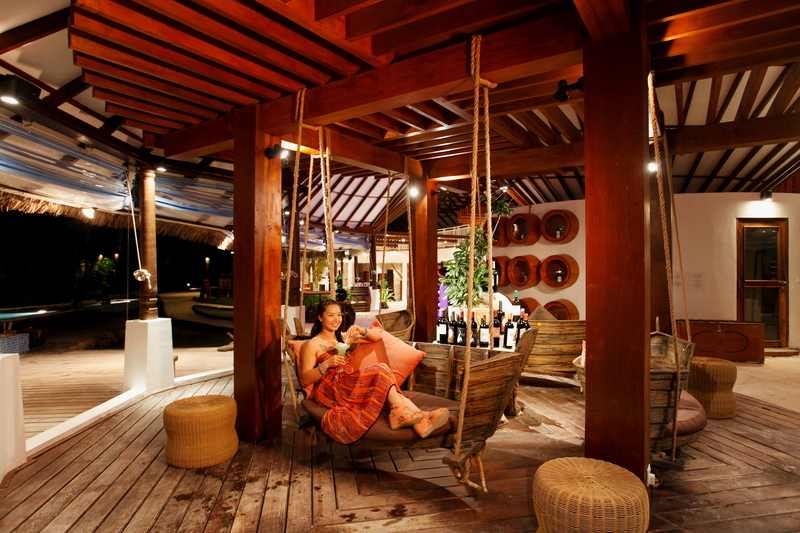 (Max 6 nights): A bottle of Sparkling Wine with Luxury Handmade chocolate served in-Villa per room per stay. 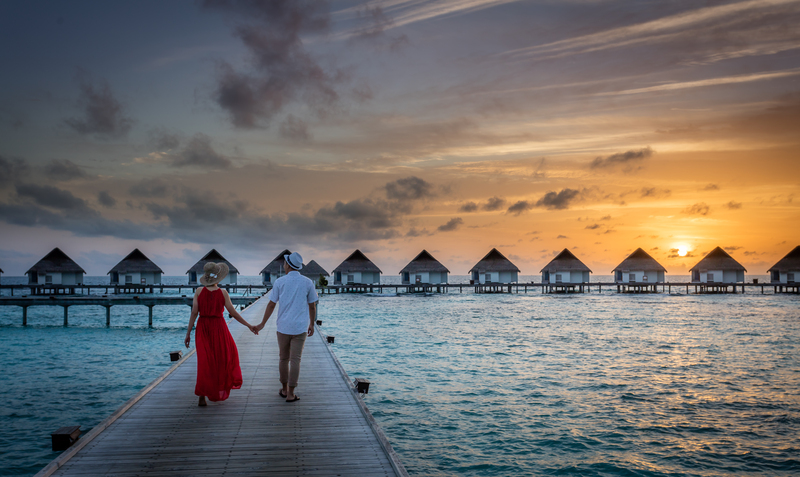 Anniversary offer: Anniversary offer is applicable if you intend to celebrate at the resort and it should be the same month as your wedding month. Wedding Certificate is a must at the time of booking and a copy is to be presented upon check-in. Anniversary Offer: A bottle of Sparkling Wine and Baby cake serve in-Villa per room per stay. The Honeymoon & The Anniversary are separate offers cannot be combined. What are you waiting for? Where is your next vacation? Centara of course!